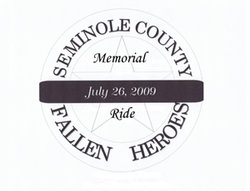 The 2nd Annual Seminole County Fallen Heroes Memorial RIde began in downtown Seminole, Oklahoma, and ended at Wewoka Lake in Wewoka, Oklahoma. It featured vendors, bands, and a bike contest as well as the Poker Run. Sheriff Shannon Smith spent his time at the lake on a tractor pulling a trolley to carry visitors around the grounds. It was a great day for Indian Tacos, music, visiting, and giving to support the cause. The Seminole County Fallen Heroes would like to thank Sheriff John Whetzel of the Oklahoma County Sheriff's Department for emceeing the event.